EDGE TRIMMER FOR CARPET Rentals Ft. Collins CO, Where to Rent EDGE TRIMMER FOR CARPET in Ft. Collins, Wellington, Greeley, LaPorte, Loveland, Windsor CO and all of Northern Colorado. Delux carpet trimmer, Crain model 245. 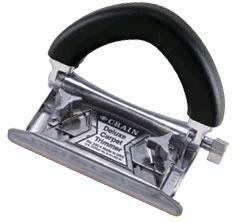 A tool made to trim carpet along the wall, leaving a straight cut. When properly set, this tool will controll the proper length of carpet needed to tuck in behind the tack strip along the wall. Comes with five shims for height adjustment, and visual throat adjustment from the base for all kinds of carpet. Wall runner is treated with a non-skid material, and is angled outward for minimum wall contact. Handle is vinyl-coated for comfort and adjusts away from the wall. * Please call us for any questions on our edge trimmer for carpet rentals in Fort Collins, Wellington, Greeley, LaPorte, Loveland, Windsor CO and all of Northern Colorado.